There were two adjoining cells with an iron door for each, one cell capacity was 4, the other 7. A six inch square hole in each door provided a convenient opening for air and for providing a space for passing in small dishes of food. The jail was situated first close to Ojai Avenue, in front of what is now Loops Restaurant [now Carrow’s Restaurant]. Then it was moved under a tree back of the rear parking lot of the Security Pacific Bank building [now, Bank of America]. Years after its use was ended, the little jail was twice offered to the City with the suggestion that it be placed in the Civic Park, but the city was not interested. Clara Koch who had become in possession of the Van Curen property gave the jail to Audrey Ovington of Santa Barbara, who engaged William J. Brakey, the famed “moving man” from Ventura to move it. 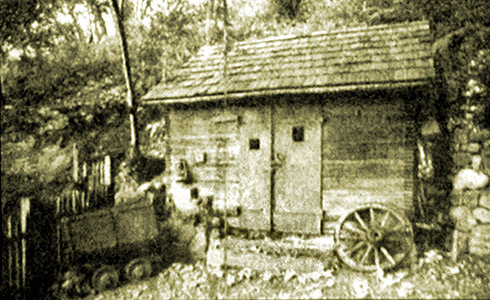 Mr Brakey took it on a flatbed truck over the Casitas Pass, and deposited it at Cold Spring Tavern. There it stands today and may be seen by anyone interested. Ed Wenig, Ojai’s home-made jail was escape-proof, Ojai Valley News, Nov. 19, 1969. Has there ever been a movement to return the jail to Ojai? Next post: A Poor Farm for the Ojai Valley?